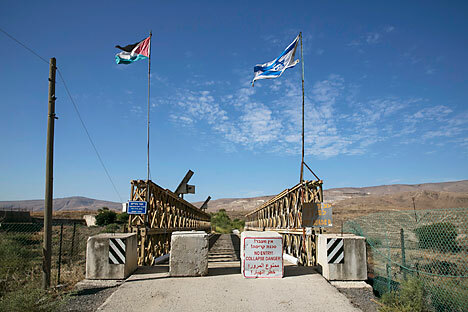 National Jordanian and Israeli flags are seen on the Naharayim bridge on the border between Israel and Jordan north-eastern Israel October 22, 2014. The Russian government has decided to render humanitarian financial aid to Palestine this year. "To render humanitarian financial aid of up to $5.3 million to the State of Palestine this year," says an order of the government published on the official legal information portal on Dec. 2. The Russian Foreign Ministry has been ordered to coordinate the aid terms and procedure with the Palestinian authorities. The money will come from budget allocations to the Foreign Ministry and the Finance Ministry under the Federal Law on the Federal Budget in 2015 and the Planned Period of 2016-2017.